A Gold Lock, a Gift and a Gorilla! Do you hear hopping-noises in the distance? This year for Easter, beside our beloved and fun Easter events, we will have a little extra for you guys to apologize for the bunch of server issues in the past weeks and also to wish you a happy Easter from our Big Farm family! 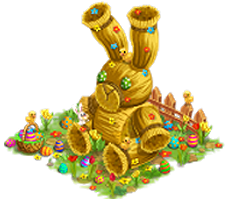 Every player will receive from us a stunningly cool WascallyWabbit Easter Bunny statue to place on one of your farms or in the Decoration Valley! - It will be available to collect from April 8th until 23rd. Welcome to the Theme Park! We’re very glad to finally give you some additional details about the upcoming Theme Park event planned to populate your Decoration Valley, which was already teased in-game. You as a thrill-seeking farmer will have to build and manage a Theme Park in the Decoration Valley where you can build event-specific consumable buildings that generate event points and decorations with high happiness values, which are, together with the event points, used as a calculation base for winning points. The event duration is roughly between 2 and 4 days and activity rewards as well as ranking rewards will be available. Please be aware that this feature will come a bit later (not on the set update day). Start the event and discover the joy of having your own Theme Park; Greta is waiting for you! An additional level has been added to all available farm machines, providing you with more booster possibilities for your daily farm life. After we introduced the Village Fair last year many of you have enjoyed the new possibilities to work together on challenges and now we would like to add new dimensions to this event and also readjust the scope. Beside an internal member ranking and some reward changes, like a change of the top rewards, lowering the thresholds for the activity reward line and also extending the activity reward line, the duration of the event overall has been reduced from 7 to 4 days and the boosters will start at 50% instead of 10%. This will also lead to an overall adapted booster system. In addition, for your convenience, the two dialogues for “Select a challenge” and “Current challenge” will be split into two separate tabs and required products will be displayed for all challenges. Now after our complete switch to HTML5, our team was finally able to work on the gold confirmation feature, which has been requested since.... forever! The gold confirmation pop-up will be triggered once you’re about to spend more than your set threshold (default: 250 gold). We hope that this little feature will support many of you in your daily tasks and reduce the frustration of accidental gold spending, which will give you more time to enjoy new interesting features. In order to use the feature you will first have to activate it in your game settings, where you can also decide for your personal threshold. Activate the feature, set you own threshold and you’re good to go! Is that a Gorilla in a straw hat?! With the final edition of Frida’s Commission we were introduced to our newest and the most ape-tastic decoration we ever had before! 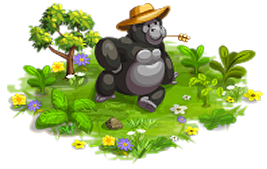 This chilled Gorilla wearing a straw hat, was the idea given by our WWC winner Modrý šmoula from the Czech server. Despite his muscular build, the Gorilla, we believe his name is Fred, is a very calm and joyful bloke who likes to enjoy a nice piece of green grass in the sunshine. At first Fred will only be given to our winner and to his cooperative, while later on he will be available for each of you to purchase. Within one of the next updates we decided to give our Decoration Valley a fun addition and launch our first event exclusively for the decoration farm! Buckle up, grab a balloon and get ready for the theme park. This event will offer a unique gameplay combined with known and loved elements. More details on the event itself and on the release date will follow soon! With the next update we will happily introduce the gold lock to Big Farm. This little security feature will give you the possibility to avoid accidental gold spending by activating another pop up once you’re about to spend gold. You decide yourself what your threshold to trigger the additional confirmation dialogue is. Do you hear the music? "Start all", Ciao Steve, New Rewards & more! Passing on the torch to Greta! With the help of Frida and the winners of the event, five new and great decorations were brought to the Big Farm world and we love them all. But Frida now decided to stop her commissions and pass the torch on to Greta for the new upcoming Worldwide Championship! Greta has been working hard to forge and shape decorations. They became “Greta's Masterpieces", FIVE beautiful decorations, from which the No.1 player across all servers can grab one. It's never too late to start sowing again! Once we dreamed of being able to rewind the whole process of the last run production by just clicking on a button. That dream has swiftly come true and it's ready to be pushed! We are happy to present the new convenience feature "Swift Seeder". It allows you to restart all currently inactive production buildings, to get some more of the same items you produced last time around. For those who are subscribed to the convenience package this is especially good news because this button is included in the subscription. In addition to the new feature, we’ve adjusted the subscription dialogue to make clearer how much each package costs per month and have added some lines for other important information. We've received feedback from you that the Wedding Planner event is not quite as enjoyable as it could be and we made some changes to the drop rate. As of the next run, you should be able to see the change and feel more at ease while helping to collect the items! Sagrada Família, Taj Mahal, Empire State Building etc... There are so many fascinating buildings all over the world and our Steve is off to see the world of architecture! Because Steve is busy exploring the world, you will no longer need to wait for him to upgrade buildings to the currently existing maximum levels, you can upgrade them anytime. After the construction tokens have been in the game for a while now, due to your feedback, we noticed that after you reached the maximum amount of construction tokens they stop being a valuable reward because they simply vanish into eternity. With this update we will make the construction tokens a choosable reward in the Hard Worker Event, the Cooperative Hard Worker Event, the Cooperative Championship and the Village Fair. Is this the real farm? Is this just mockery? Listen up! For the next horse season we are glad to present you our stunning and fun new avatars, decorations and skins with the theme “Music”. Meet Amy Goathouse and Bacon John along with many others in the cool avatars. To be applied to your residential building and your premium residential building. There will be new library books available for the items of the Mermaid Bay Restaurant, which will help you with a little extra boost. With this update we introduce a new concept for offers, which might already be known by some of you from Empire (If you happen to be a knight as well as a farmer). You’ll be presented three different content packages with 1 up to 6 items, which have different unlock thresholds. There are of course more than three different packages available but only three will be displayed at the same time. Before making a payment to unlock a package, you’ll have to select the corresponding package. Our final switch to HTML5 is now done and we’re happy to have all of you on board for the ride! The decision to upgrade to HTML5 and leave Flash behind is one that has been out of our hands since Flash is soon to be deactivated as an outdated technology. Today you are “only” asked to allow Flash on a website any time you visit it, by July 2019 browsers like Chrome will automatically disable Flash and you will have to change something in the browser settings to make it work. By 2020 Adobe will completely stop the support for this software. As we are still bringing new farmers to the game it was very important to us to have the switch to HTML5 done before July 2019, so we still have a chance, to attract new farmers without them having to fiddle around with their browser settings. Another reason to switch as soon as possible was to avoid additional effort in maintaining two versions (Flash & HTML5) at a time: it’s not only double the effort in testing and bug fixing, but also a lot of additional technical steps that have to happen in the whole process to a tested playable version. All in all you also benefit from saving that effort, as we can focus on bug fixing for one version and take less time to work on changes and features. If you have any issues with HTML5, please check out this troubleshooting section! Speed/ performance issues: If you are using Edge, please try switching to Chrome, Firefox or Opera. You can also read some general troubleshooting tips for speed issues below in our guide. We are working on speed and performance improvements and hope to alleviate issues for our users. Touchscreen navigation: Users on touchscreen devices (including touchscreen PC/laptops and mobile devices) are unable to scroll around the farm. Although we do not directly support touch screen devices on Big Farm we are considering if and how we can do anything to resolve this. Some text/images are blurry or fuzzy, what can I do? Blurry assets have been reported by some users in the HTML5 version and we are currently working on a fix for this issue, with progress going very well! If you have already tried increasing the zoom level on your browser, as described above in the troubleshooting section, and it has not been effective for you you can also try the following steps for Windows 10 computers. In the Display menu, locate the section titled ‘Scale and layout’, then find the ‘Custom scaling’ option and click on this. This step is a temporary solution and you can always return to these instructions to set the zoom level back to what it was previously. We already have a fix being worked on for this issue; though it is not yet complete we hope blurry assets will soon be a thing of the past. In the meantime, try the above steps to make your play experience a little more comfortable for you until then. The game graphics/ assets don’t load as intended, what can I do? In case you just started the game, but there are no graphic assets shown or they don’t load properly, please be so kind and press “F5” in order to reload your browser. This should fix the most common issues related to missing or not loaded graphic assets. I’m having issues with lags, what can I do? You always have the option to deactivate animations and reduce the quality when you’re experiencing any performance issues with your game. This might help with lags and freezes. To do that open the “options”-menu, which can be found in the right upper corner of your screen, select “settings” and untick the box for “animations” and set a lower quality, “medium” or “low” for instance. In addition it might help to clear the cache and delete the cookies from your browsers to achieve a better performance. Further instructions how to do that can be found here. I have problems logging in, what can I do? At first please assure you’re using the correct URL http://www.bigfarm.goodgamestudios.com/ and no other because that will most likely cause issues (partnerside links of course excluded). If you made sure you’re using the correct link, please check if clearing your cache and deleting your cookies does the trick. It is also always a good option to try using different browsers to further identify the issue. If none of the above options work, we’d recommend contacting our support or leaving a comment in the forum with your issue. Like this, our team gets informed and we can further investigate the issue. My small chat window is showing the oldest messages available instead of the newest ones, what can I do? In this case you can easily click on your chat window and it will update itself to the most recent messages. Which browsers are recommended for HTML5? HTML5 is a technology that should work well in any supported browser you choose. If you are not sure if your browser supports HTML5 please check the software developer’s website for more details. While you should be able to use any browser, we recommend using the most up-to-date version of either Google Chrome, Mozilla Firefox or Opera. We specifically advise to not use the Internet Explorer. Find further explanations on the reason below. Currently (February 2019) Microsoft Edge is not working optimally. Microsoft plan to make some changes in the next few months that will make their browser work more like Chrome and hopefully this will also improve the user experience in future. Keep an eye on their updates for more news on this. Where can I get Google Chrome from? You can easily download Google Chrome from their website here. After clicking “Download Chrome” a new window will pop up, where you´ll have to confirm the download by clicking “Accept and Install”. Before this step please decide if you would like to set Google Chrome as your default browser and if you want to allow the browser to automatically send usage statistics and crash reports to Google, then select the relevant options as they appear. An install file will be downloaded and the installation will start right away if you are performing this with Internet Explorer (when using Firefox, a bar with the downloaded file will appear at the bottom of the page, which you will need to double-click and then accept the installation by selecting “Run”). Where can I get Firefox from? In order to install Mozilla Firefox please visit their website here. Select “Download Now” and the file will be downloaded to your computer. A new window will pop-up on the bottom of the page asking you how to proceed with the downloaded file. Choose “Run” and Mozilla Firefox will be installed (when using Google Chrome there’s a bar with with the downloaded file will appear at the bottom of the page, which you will need to double-click and then accept the installation by selecting “Run”). Where can I get Opera from? In order to install Opera please visit their website here. Select “Download” and the file will be downloaded to your computer. A new window will pop-up on them bottom of the page with the downloaded file. Click on the pop-up. Another new window will appear asking you how to proceed with the file. Choose “Select” and the Opera installation dialogue will pop up. Click “Install” and the installation will start. Why shouldn’t I use Microsoft Edge? As of February 2019, Edge is not currently recommended due to some performance issues, but later updates by Microsoft may improve this. For now, please use Chrome, Firefox or Opera. Why shouldn’t I use Internet Explorer? Internet Explorer is an outdated browser and will continue to cause more issues with your general browsing as time goes on. Microsoft have stopped actively supporting the browser except for some small security updates and will eventually completely remove support. If you are still using Internet Explorer it is vital that you upgrade to ensure a smooth and secure browsing experience in future, not just for Big Farm but for your general use of the internet. I changed my browser, but I can’t find the game anymore! What do I do? Don´t worry, your cows are safe! If you have changed the browser you are using for Big Farm, your bookmarks from the old browser are not automatically transferred and your simple method of connecting to the game might be lost at first. But you can easily find the game by visiting the website http://www.bigfarm.goodgamestudios.com/ and saving it as a bookmark (see the below question for more details on how to do this). How do I set a browser bookmark? Visit the website for which you intend to save a bookmark. Click on the star icon on the right hand side of the URL bar (address box). Either use the pre-entered name or name your bookmark how you would like it to appear. Decide where you would like to see your bookmark after saving it. The best location would be to save it in the Bookmarks Bar (Chrome/Firefox) or the Favourites Bar (Edge), so you will always see it on the top of your browser. I already have a bookmark, do I need to update it? Yes! Though you may already have a working bookmark we recommend you ensure it leads to http://www.bigfarm.goodgamestudios.com/ and no other URL. Other URLs may result in issues with loading or accessing the game, so please make sure any saved bookmarks use the correct address. We recommend updating your current bookmark anyway, just to be on the safe side. I see values displayed in-game, which seem to be incorrect, what can I do? A good old refresh (F12 key on your keyboard) does the job in those cases and should solve this issue. If wrong values are still displayed and you think you are missing products or any other farm items, please contact support and report your loss. How do I play Big Farm? You can play Big Farm in the same way as usual, just visit http://www.bigfarm.goodgamestudios.com/ (you can bookmark this link too so it’s always easy to find) and login to your existing account or register a new one if you haven’t yet. Please do not use any other link to access the game as this may result in errors or inability to connect/play. What about the standalone Flash player I used to use? It’s true that in the past we gave advice on how to play the game using a standalone Flash player, which some have been using for a while now. Since HTML5 and Flash are not compatible technologies this will no longer be possible. If you have previously been using the Flash player, please stop attempting to connect via this app or any other URL than http://www.bigfarm.goodgamestudios.com/ as it will not work or allow you to play any longer. What will happen with my account? Nothing! That is, we won’t be making any changes to your account and you can still access the game with your old account and continue to play with that account in the HTML5 version. It couldn’t be easier! Will my login details still work? Your login details will still be valid and you can log in as usual. Please make sure to have your password available and register your email address by collecting the in-game welcome gift as this will ensure you are always able to change your password without our assistance if you need to do so. What will happen to my game progress? Your farm will remain in the pristine condition you remember it (so long as you left it in a pristine condition!). Nothing will change here and progress will not be lost. I forgot my password! How can I login again? If you have forgotten your password and registered with an email address, you can easily retrieve a new password through the “Forgot password?” icon on the login page.Just click on it and a new box will appear asking for your registered email address. Type it in, click the green button and you will be sent an email with instructions on changing your password. Please also check your spam folder since sometimes our emails can get caught in there. If you didn't register with an email address, please contact our support with your correct username and a valid email address we can contact you on. You can find our support here. I don’t know my account login details! What can I do now? If you can´t remember your login details, don´t panic! If you registered your account with an email address, you can retrieve your password through the “Forgot password?” button. The email you receive will also clearly display your username. You can also check other emails we have sent you, such as the email with the welcome gift for registering for the game. It is important the you recall your login details as our support team cannot help unless an account can be located, so please ensure you write your details down somewhere safe for your reference. My account is blocked/banned! What can I do? If your account has been blocked or banned, indicated by a message appearing stating as such when you attempt to login, you can contact our support department for more information and assistance by clicking here. How do I shorten a link in order to post it in the in-game chat? Link shortening services are very common, especially if you are a Twitter user for example. While a Google search will bring up a few results, the Big Farm team recommends using the bitly link shortener service. This allows you to paste links which are much, much shorter than the full length version and save space in the chat box or messages. You can get to Google link shortener by clicking here or typing ‘bitly.com’ into your browser. Then simply paste the link you want to shorten and click the ‘Shorten’ button to get a nice and compact version of your link to paste where you like. Can I play Big Farm on my mobile device? Aside from our mobile version of the game, Big Farm: Mobile Harvest, the new HTML5 version of the game is playable on regular mobile browsers. The game is still targeted at desktop PC devices and any errors resulting from playing on a mobile device cannot be accounted for, but the possibility should be available to try playing the game on your mobile! Check out our explanation on this topic here. Currently the joy of playing Big Farm on your mobile devices is blocked by an issue, which prevents users of some browser Apps such as Google Chrome and Firefox Apps from navigating within their farm, which makes farming quite a challenge. But Big Farm is still playable with Puffin browser. Here is a small workaround for you: Activate the mouse cursor or trackpad feature from the menu setting, hold down the mouse cursor or trackpad for a bit until the circle appears on screen. Once the circle is charged, you can drag the screen and move around your farm. For the other options, we’ll see if there is anything that can be done from our side. Please note: This announcement will regularly be updated by us to always cover all important questions you guys have. A big change and a whole lot of animal news! With this update we’re deactivating the possibility to switch back to Flash and the game will run solely on HTML5. 1. You haven’t received the final deco for the 24th of December from our Advent Calendar? Every player, who was online on that day, actively played the event and didn’t get the chance to open the final Advent Calendar door, will receive the final decoration from us. 2. As a leader or deputy of your cooperative you lost the independency to start upgrades for coop buildings? Deputies and leaders are again able to start upgrades without the need of votes from cooperative members. 3. You received decorations from Santa’s Wheel which were not unlocked in the deco tower after building them and/or which were shown with a wrong information dialogue? The corresponding slots in the deco tower for the decorations won from Santa’s Wheel will be unlocked and the wrong information dialogues were fixed. If you have the decos, which were not unlocked in the deco tower, built on your farm already, you’ll have to store them and rebuilt them in order to trigger the unlocking. If you trashed corresponding decos already, they will not be unlocked. 4. You couldn’t see the trophy you won from the Cooperative Championship in your cooperative village? The trophy, if won from the Cooperative Championship, can now be found at it’s usual place in the village. Also in 2019 our Valentine’s Day event is back and will give you the possibility to win an awesome new decoration and flag, which is going to make you melt away. Jump right in, collect the romantic gifts as drops from all production buildings on the main farm and search the balloons which are hidden on all 5 permanent farms (not on the new decoration valley). When the barks are replaced with grunts, you know that a Chinese New Year has started and a new animal is being celebrated. This time it is the pig! Explore the new decorations and construct your pig statue as you like, by collecting different zodiac drops, to impress your friends and to make the pig spirits proud of your achievement. While speaking of hoofed animals.. We’re happy to tell you about our new horse season! We’re bringing the old band back together and you’ll get the chance to win your favourite avatars and decorations from 2018. Get ready and break a leg! We’re finally resolving some issues with the cat tree in order to make this feature enjoyable again. These fixes also include, beside some blocking bugs, the cat charms being choosable rewards and lower requirements to unlock the cat tree. Rearranging your farm was never this easy! A while back we introduced layout mode to the game, which provided an easy and comfortable way of reorganizing your farm with temporary storage and a bunch of time saved! We know you loved it, and we did too, but the feature didn’t come without its problems and had to be removed and reworked. We are now very glad to announce that this option will be back after this update for everyone to use again! There is also the new addition of "Store All" buttons, which allow you to store all decorations or all buildings in one click. We’ve been mentioning the Trade Center, formerly called the Combined Trader, for quite a while now and with this update we can finally announce that it is in fact going live! Use the possibility to get your favourite items from only one trader and get all sorts of goods without waiting for the right trader to appear on your farm. Benny is excited to welcome you as his customers! Displayed icons in the Decoration valley are now fitting the farm inventory they came from. Cooperative village upgrades now need to be voted on before the upgrades will start. Restart Bigfarm and then the problem is cleared away so you may buy personal boosters. Hello farmers, First of all: Thank you for your patience and sorry that we kept you waiting! We can finally give you news on the problem with Santa’s Workshop which occurred during the Christmas break. During the 2nd run-time of Santa’s Workshop, from December 20th until January 1st, 240 gold was deducted under certain circumstances when the event was opened. We’ll give every player, who lost gold due to this faulty event behavior, their spent gold back. We were able to compile a list for this data and the reimbursement will be performed soon.The date will be given as soon as it’s confirmed. The other issues, which occurred, will be dealt with over the next days and we’ll keep you informed in this thread. Gold refunds have started - They are being done one server at a time, so don't panic if you haven't got yours yet & someone on another server has theirs. We recently compensated users for their gold losses in the Santa’s Workshop event. We have had a few cases where people complained they did not receive the correct amount of gold. This is not possible due to the way the compensation was performed, which we will give you some more details about here. Gold lost in this event was not lost precisely as we first reported. The initial reports came in saying gold was being deducted once per day, but once the team was back in the office and able to check on the reports more fully we discovered that it was not as simple as opening the dialogue and gold disappearing on a daily basis. Instead, some very specific circumstances led to losses and so losses cannot be calculated by saying ‘I played on 4 days after the issue was reported, therefore I must have lost 4 days worth of gold’. Instead, we have used very precise tracking on the amounts spent to return the exact amount lost to each player that lost gold. CM has been forwarded a number of cases to check and in every case the amount given has been correct and exactly matches the amount lost. Some miscalculated their losses while others did not see a popup for the gold and assumed it had not been credited. If you have not seen a popup and should have received compensation it is very possible the credit came late, but in all cases the crediting of gold was successful and the method used to determine losses and compensation amounts was highly accurate and successful. If you lost gold to the Santa’s Workshop issue then you were on our list, and if you were on our list then you have already received gold compensation. Please be sure to refresh your browser and update your gold total, it may be possible that you did not receive a popup as some did but in all cases thus far the compensation has been 100% correct and accurate. Thanks everyone, we are pleased we were able to deal with the situation so quickly after the team returned to the office in full force, we again apologise for any gold losses from the event and appreciate your assistance in reporting issues and helping us to track down the problem and getting it resolved.